The Dunedin Craft Beer and Food Festival is currently taking applications of interest from breweries and food vendors for 2014. 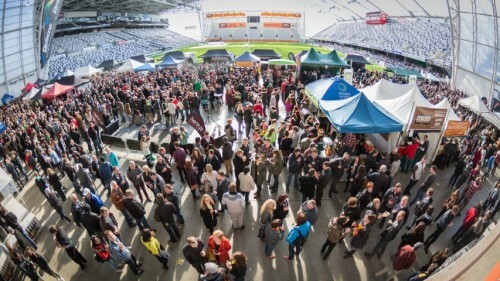 Featuring fine food as well as the best beer from around New Zealand, the craft beer and food festival is set to take place at Dunedin’s Forsyth Barr Stadium on 4 October 2014. More than 3,500 food and beer lovers attended last year’s event, which was organised by the specialised events team from the Otago University Students’ Association (OUSA). OUSA general manager Darel Hall said the 2014 event would build on the success of last year’s Dunedin Craft Beer and Food Festival. “We had excellent feedback last year and we’ve all been working away at new ideas to make the day even better. Our team has created a new layout with more space with extra seating including use of the grassed area for families and picnic style seating”, he said. Families remain a focus of the Dunedin Craft Beer and Food Festival with improved kid’s entertainment. Meanwhile, the event will remain free for those aged 14 and under when they attend the event with a paying adult. “This is about building on the success of a popular Dunedin event showcasing great food and great beers and encouraging life-long and temporary Dunedinites to support local businesses that we want to hear more from” said Hall. “Our goal is an iconic event that all Dunedin supports”. Early bird tickets to the Dunedin Craft Beer and Food Festival 2014 will be on sale from 1 July 2014.